The Reference 75 SE is a stunning amplifier in every way – performance, styling and reliability combined to elevate your music listening to a new experience. Capable of controlling a wide variety of speakers, the Reference 75 SE will transport you into the musical performance unlike any other comparable amplifier. At the heart of the Reference 75 SE is decades of proven Audio Research vacuum tube technology, a legacy unrivaled by any other manufacturer of tube electronics. Developed through hundreds of hours of critical listening, the carefully selected components comprising the Reference 75 SE combine to provide an amplifier which transcends traditional hi-fi, instead relaying music with realism and tangibility. Visually, the Reference 75 SE hearkens back to past Audio Research products, taking inspiration from earlier amplifer designs. With its two large VU meters, which display power output as well as provide bias adjustments, the Reference 75 SE has a timeless appearance resembling precision laboratory equipment and an overbuilt, industrious aesthetic. Offered in both natural aluminum and black finishes, the understated look will complement any system. 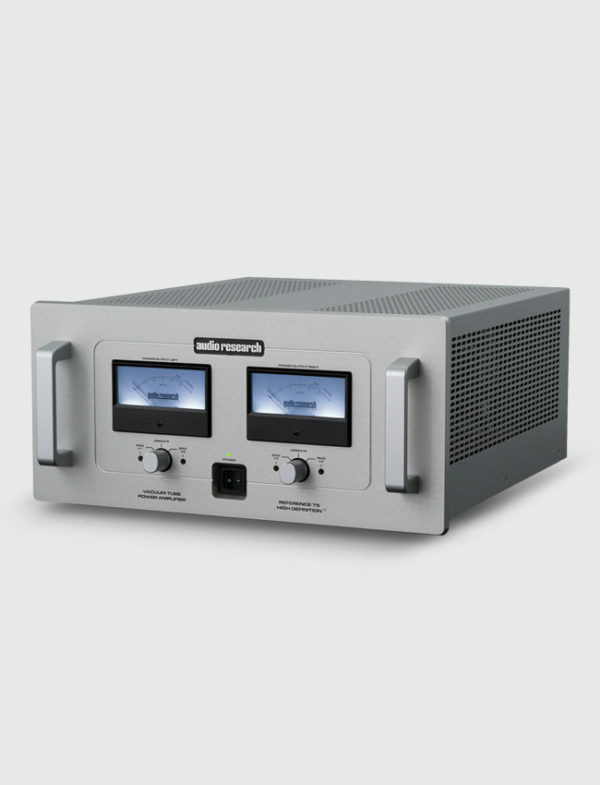 The KT150 vacuum tube delivers power from the amplifier to your speakers. Newly designed solely for the audio industry, the KT150 offers higher power handling and current delivery. A matched pair of tubes per channel run conservatively, ensuring stable operation and many hours of trouble-free listening. Custom designed capacitors couple the output of the tubes to the speakers for the purest signal possible. The Reference 75 SE is the new generation from a lineage of amplifiers only Audio Research could produce. Experience real music and unleash the capacity of your system – music in High Definition®. 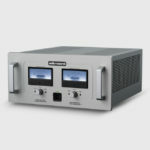 POWER OUTPUT 75 watts per channel continuous from20Hz to 20kHz. 1kHz total harmonic distortion typically 0.6% at 75 watts, below 0.05% at 1 watt. Approximate actual power available at ‘clipping’ 76 watts (1kHz). (Note that actual power output is dependent upon both line voltage and ‘condition’ i. e.: if power line has high distortion, maximum power will be affected adversely, although from a listening standpoint this is not very critical. )POWER BANDWIDTH (-3dB points) 7Hz to 60kHz.FREQUENCY RESPONSE (-3dB points at 1 watt) 0.7Hz to 75 kHz.INPUT SENSITIVITY 1.4V RMS BAL for rated output. (25 dB Bal gain into 8 ohms.) INPUT IMPEDANCE 300K ohms Balanced. OUTPUT POLARITY Non-inverting. Balanced input pin 2+ (IEC-268). OUTPUT TAPS 8 ohms, 4 ohms. OUTPUT REGULATION Approximately 1.0dB 8 ohm load to open circuit (Damping factor approximately 8). OVERALL NEGATIVE FEEDBACK 15dB.SLEW RATE 10 volts/microsecond.RISE TIME 4.0 microseconds.HUM & NOISE Less than 0.06mV RMS – 112dB below rated output (IHF weighted, input shorted). POWER SUPPLY ENERGY STORAGE Approximately 520 joules. POWER REQUIREMENTS 105-125VAC 60Hz (210-250VAC 50Hz) 410 watts at rated output, 500 watts maximum, 230 watts idle. TUBES REQUIRED 2 – Matched pair KT150 – Power Output; 2 – 6H30 Driver. DIMENSIONS 19" (48.3 cm) W x 8.75" (22.2 cm) H x 19.5" (49.5 cm) D. Handles extend 1.5" (3.8 cm) forward.WEIGHT 47 lbs. (21.3 kg) Net; 63 lbs. (28.6 kg) Shipping.